Welcome to the Best Western Pasadena Royale Inn & Suites! Experience Southern California from the charming and affordable Best Western Pasadena Royale Inn & Suites, just minutes from the Rose Bowl, Staples Center and Old Town Pasadena. The Best Western Pasadena Royale Inn & Suites is a conveniently located choice for guests traveling on business or pleasure. There's something for everyone within a short drive of this Pasadena hotel. Coming to cheer on your favorite college football team? The iconic Rose Bowl and Rose Bowl Parade are just six miles away. The state-of-the-art Pasadena Convention Center is approximately five miles away. Want to enjoy southern California's beautiful scenery and mild weather? Be sure to check out the Los Angeles County Arboretum, the Huntington Library and its botanical gardens, the Santa Anita Racetrack or the monthly Rose Bowl Flea Market. There are also plenty of shopping and dining opportunities in historic Old Town Pasadena. Conveniently located near the I-210 Freeway and with easy access to the 110S Freeway, guests often choose the Best Western Pasadena Royale Inn & Suites as their home away from home while attending a game or event at the LA Convention Center, Staples Center, Nokia Theater or Dodgers Stadium. Los Angeles is just 10 miles away, and this Pasadena hotel is also within an hour's drive of unlimited family fun at Universal Studios , Knott's Berry Farm , Disneyland and Beverly Hills. Additionally, guests traveling on business are close to local organizations. Our Pasadena hotel strives to make your stay as convenient as possible by offering amenities that include a Hot Breakfast buffet, an outdoor swimming pool with hot tub, guest laundry, business center , our 63 well-appointed guest rooms and suites are each fully equipped with HD Cable on LCD TV and high-speed Internet access. Make your Pasadena vacation a memorable one. Book today and save. From: Interstate 210. Take the Rosemead Boulevard Exit south one block to Colorado Boulevard. 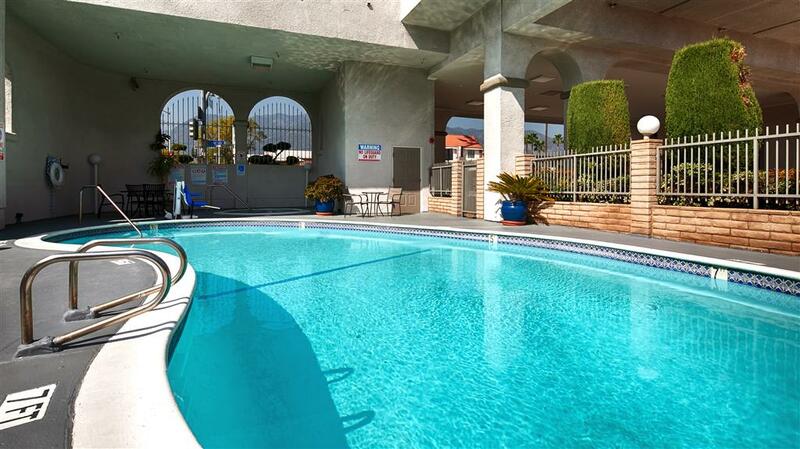 Travel two blocks west on Colorado Boulevard to the Best Western Pasadena Royale Inn & Suites.